Howard Gobstein issued both a challenge and a warning to those of us in higher education. Universities aren’t keeping up with the pace of societal change, he said, and the initiatives to improve education at the local, state and national levels too often work in isolation. “We’d better start talking to one another,” said Gobstein, vice president for research policy and STEM education at the Association of Public and Land-Grant Universities. 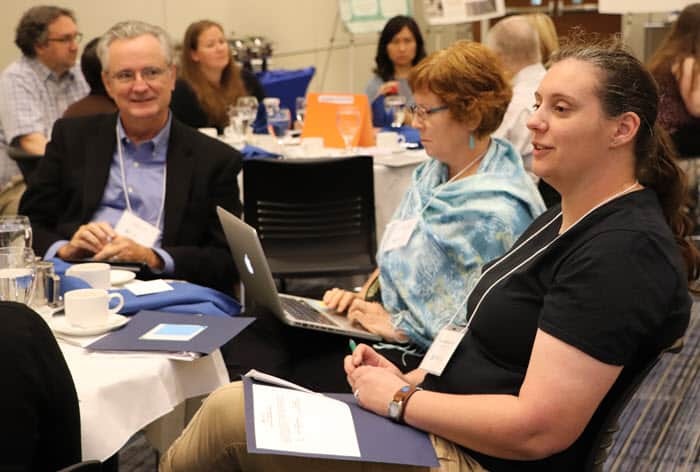 Gobstein spoke in Lawrence last week at the annual meeting of TRESTLE, a network of faculty and academic leaders who are working with colleagues in their departments to improve teaching in science, technology, engineering and math. Pressures are building both inside and outside the university to improve education, he said, citing changing demographics, rising costs, advances in technology, and demands for accountability among the many pressure points. Universities have created initiatives to improve retention at the institutional level. Departments and disciplines, especially in STEM, have created their own initiatives. Most work independently, though. Not only that, but national organizations have created STEM education initiatives focusing on K-12, undergraduate education, graduate education, and industry and community needs. Those initiatives often overlap, but all of them are vital for effecting change, Gobstein said. “To transform and to make it stick, there has to be something going on across all of these levels,” he said. Universities must also work more quickly, especially as outside organizations draw on technology to provide alternative models of education. Gobstein made a similar argument last year at a meeting of the Bay View Alliance, a consortium of North American research universities that are working to improve teaching and learning. Demographics are changing rapidly, he said, but STEM fields are not attracting enough students from underrepresented minority groups and lower economic backgrounds. 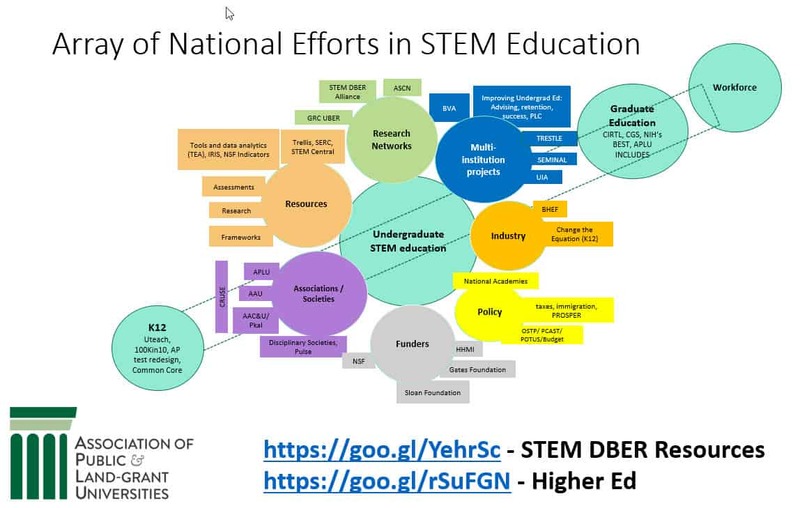 Howard Gobstein showed this chart to demonstrate the breadth of STEM education initiatives across the United States. Change starts at individual institutions and in gateway courses that often hold students back, he said. Research universities must value teaching and learning more, though. “It’s the recognition that teaching matters. 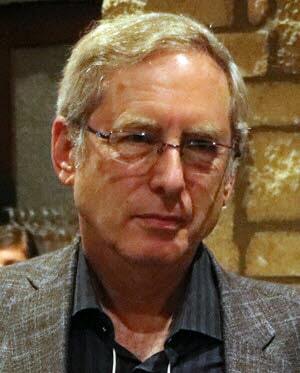 It’s the recognition that counseling students matters,” Gobstein said. Higher education is also under pressure from parents, students and governments to improve teaching and learning, to make sure students are prepared for the future, and to provide education at a price that doesn’t plunge families into debt. “We seem to be losing ground with them as far as their confidence in our institutions to be able to provide what those students need for their future, particularly at a price that they are comfortable with,” Gobstein said. Sarah LeGresley Rush (front) and Steve Case of the University of Kansas participate in a discussion at TRESTLE with Joan Middendorf (center) of Indiana University. What does teaching mean in an era of rapidly changing technology? How do we measure the pace of change? How do we know that we are doing better this year than in previous years? How do we make sure the next generation of faculty continues to bring about change but also sustains that change? He also urged participants to seek out collaborators on their campuses who can provide support for their efforts but also connect them with national initiatives. “What we’re really trying to do is to change how students learn, and we’re trying to make sure that all students have access and opportunity,” Gobstein said. Despite the many challenges, Gobstein told instructors at TRESTLE that the work they were doing to improve teaching and learning was vital to the future of higher education. “You are doing work that is some of the most important work any of us can think of doing,” Gobstein said. Tagged a, change, course transformation, future of higher education, STEM.